MUKONO – Mukono Municipality MP Betty Nambooze Bakireke has told her Kyadondo East counterpart Robert Kyagulanyi aka Bobi Wine that he faces a bumpy road in his struggle against the current government, warning him that he should not expect much help from Ugandans whom she said are cowards. 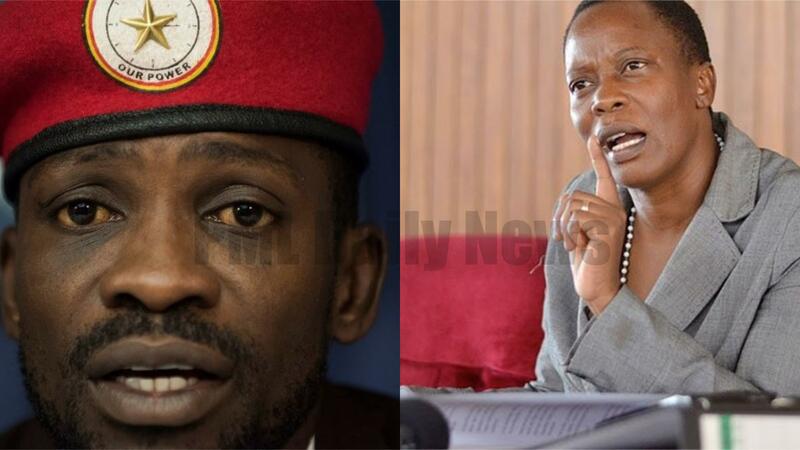 In a strongly worded open letter posted on social media site Facebook, Ms Nambooze told Bobi Wine that he will suffer more brutality at the hands of the state and even the Ugandans currently backing him will turn against him. “I have read the Police guidelines issued to “regulate” your return journey. I know the journey you are headed to, having walked the same path many times…in summary, the Police is saying that Security will kidnap you on arrival and drive you around recklessly, then deposit you home later in the day battered, crestfallen and frustrated,” she said. “Our people are weak. It’s mostly excitement that drives them, they find happiness sort of in our suffering, the sort of happiness and excitement one gets while watching a horror movie. A few semi-brave characters will cause skirmishes but that is all…eventually they will forget and even start insulting you, some will even feel it’s you who gains from your suffering,” she added. The outspoken legislator alluded to opposition leader Kizza Besigye whom she said has been a victim of police brutality and state-sponsored propaganda. “My brother Bobi, you are headed for the long walk but this is the journey all freedom fighters have walked and must walk…the people abused Mandela, they killed Gandhi, they killed Martin Luther…the very people who were victims of misrule! The Police will beat or even kill and thereafter these deaths and torture will be blamed on you, not Police not Museveni…”Battisa abaana b’abantu Nga bo olubakwatako bagenda America“, they will later accuse you,” she said. “Some people with you(hope they are genuine this time) have been accusing Dr.Besigye of doing what you are set to do. They say, he causes havoc in Buganda to improvish Baganda….they tell people that; see his businesses are prospering, he is in the same boat with Museveni,look his wife works for UN,look at his big house,Besigye bought that hotel the other day,that man is funded by bazungu, look at his son Anselm (Solomon Kampala) what type of father is he,…..etc…,” she added. You maybe airborne by now but I know you will find this note and read it when you land home. I have read the “Police guidelines issued to “regulate” your return journey. I know the journey you are headed to having walked the same path many times…in summary, the Police is saying that Security will kidnap you on arrival and drive you around recklessly then deposit you home later in the day battered, crestfallen and frustrated. My brother Bobi you are headed for the long walk but this is the journey all freedom fighters have walked and must walk…the people abused Mandela,they killed Gandhi,they killed Martin Luther…the very people who were victims of misrule! The Police will beat or even kill and thereafter these deaths and torture will be blamed on you, not Police not Museveni…”Battisa abaana b’abantu Nga bo olubakwatako bagenda America“, they will later accuse you. For violence committed against people by the State while fighting you…they will shift the blame to you…yet how can one avoid mayhem by the State security apparatus that does apply violence so that in fear of violence, the people can give up on their rights? Museveni has always used this as a strategy, he believes in it as an ideology, he even wrote his University thesis justifying it. No wonder his mouthpiece Mwenda is now advocating for genocide as a mean of “cleansing” Uganda. Bobi, I am not saying this to discourage you, no we must fight on. I liked it when you said that you will rather die trying but not giving up on the struggle for freedom; that was brave of you. I know where you have reached is a point of no return….And there is only two roads for you. Forget that it’s not you who is great and experiment on taking the masses who support you to a wrong direction like Nasser Ssebagala (God forbid) or remain consistent and battle dictatorship like Besigye despite the risks (I pray that you take this road). Lastly, Bobi, some propagandists in favour of the regime or comrades who have old scores to settle have opportunistically taken high table positions in your crusade…they are setting you up for a battle with fellow freedom fighters. They are cheering you on and are advising that you create a “third force”…they want to ride on your back and divide the forces of change into two warring groups. Yet as you have always said, Uganda is divided into two groups; the Oppressor and the Oppressed….we might not be under the same command but we are definitely pushing in the same direction. Your first test in leadership therefore lies in how efficiently and promptly you will prevail over these anti ~change agents or confused comrades dressed as part of your team….don’t be tempted to harvest mischief you will never be able to feed it to it’s satisfaction. We shall talk a lot in future…well come back to Kyadondo, let the struggle be refreshed and energised by your great addition…May God be with you. WE ARE THE CHANGE WE ARE WAITING FOR!